Think about what your goals are for this event. Do you have a certain dollar amount you need to hit (I just wanted to pay myself back my booth fees)? Are you just looking for an educational experience? Do you want to network with the other crafters and keep an eye out for a mentor? Are you trying to get people to Like your Facebook page? Do you need to gauge people’s reactions to your items and see what sells best? Are your trying to get custom orders while you have like items out on display? Knowing what your goals are will help you to prepare for them. For your display you want to present a micro-retail space. All of the information your customers might want should be accessible, like whether you take credit cards, what your url is, or your Facebook page name. Think about lighting. Think about where you will stand. Think about what will draw the eye of the customer. Also try to maintain your branding. Set on a feel for your look and colors, and use that look throughout. It will give you a professional feel. You should have a good idea of what your favorite aesthetic is, and odds are good most of your items reflect that, so focus on what you love and carry that through all of your display. I really wanted to display my banner behind my booth, above eye level so it was highly visible. However, I did not have time to make stands and there were thingies in the way on the wall behind me. I settled for binder-clipping it to the tablecloth on the front of the table. If I get a tent later I can just tie it up there. Actually, the banner was my “one thing.” One thing will go wrong. You know it will. If you’re lucky, just one. Apparently, my banner jumped out of the tub with my display frames at some point. 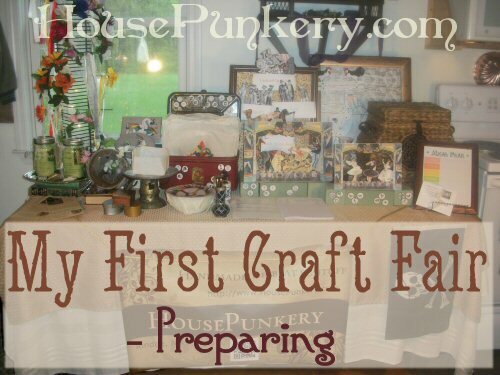 So I got to the craft fair, and no banner. Luckily I had plastered my name and logo all over my signs, and put a little sticker with my url on any item that would allow it, so this wasn’t a disaster. But my helpful sister ran back home, and after some searching in my craftpocalypse of a house, brought it to me. My banner has my business name, tagline, url, town, and qr code. I put my town because I wanted people to know they were buying local, but I did not put my address since it is a home business. FYI I got a business phone number through Skype and forwarded it to my regular phone. The “free” business cards from VistaPrint were cheap, but of course I already have my own designed at this point. I just needed to get that order in to allow for shipping time. So I chose the design closest to my aesthetic and used that. It looks fine, since I have a good mental picture of my look. I had cards on either end of my booth, as well as some in my checkout stand to include with purchases and hand out with people I chatted with. I also had a sign right next to my cards indicating that I had an Etsy shop, so people knew they could go look later. One of my signs had my logo, url, and the logos for all of my social media including Etsy. The most interaction I had was people taking cards, to give me a Facebook like, to shop later, to network, I dunno. But they had my info with minimal effort on my part. You can print your own cards if you want to keep costs down, but frankly between the paper and ink it isn’t actually cheaper. I need to get better about handing out business cards in real life. In the future I would rather have postcards available so I can put some item photos and stuff on there. One of the best things I did was to bring an old magazine rack (like this one without the lamp) I got for $1 at a yard sale. 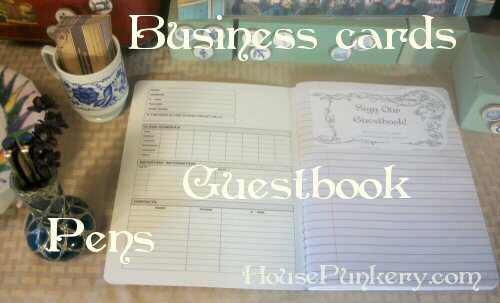 I kept my checkout binder in the little rack underneath, which has my sales receipt book (two part with address labels on each page), calculator, pens, custom order forms, business cards, cards with instructions for the items that need special care, clipboard, etc. Plus tissue paper and tape for wrapping, and coloring pages to include with the children’s items I sell. Right next to it was a little bag (like this craft tote, only free form the town swap shop) with plastic bags for sending items off in, and a little toolbox with needful things in it like masking tape, extra tags, thingamabobs for fixing things that break, and a red pen for marking down prices. The tabletop just fits under the tables and was a good spot to put our drinks, so they weren’t on our table or on the floor, and I could adjust how much of the table sticks out depending on the booth setup. One article said to bring one of those drawer rolling carts so you don’t even have to unpack your checkout stuff. I bought a pack of banker’s boxes from WalMart, it was a 10 pack for $17 (Amazon has them but they cost more). This is way cheaper than $8 a plastic tub, and I think I like the size better. They are a little smaller and more square. I can’t carry heavy stuff, so this helps me to not overpack. Of course, they aren’t as sturdy or as waterproof as tubs. If I was going to buy the tubs I would spend a little more for the clear ones. But they boxes are cheap, and really easy to load in the car. I have a wee station wagon and will have troubles if I end up getting a tent. Packing is not my strong suit. I had a guestbook out for people to sign and hopefully join the mailing list. Nobody signed it. I had it at the end of the table and I think people walked right past. Next time I will put it in the center of the table so it is visible, and invite people to sign as they chat. 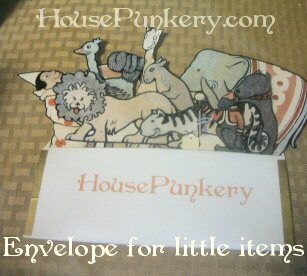 Possibly I will offer a giveaway to try to get people to join the mailing list. You need to build your display up to eye level, so people can see things from the next row over, and people who are powering through the middle might see something they like. You have about two seconds to grab the attention of people going by. I think for some people it was even less than that, they were chatting or looking at the booth across the way and I needed something to grab their attention and pull them to me. Get as much of your schtuff as possible up at eye level so people don’t have to work to notice it. 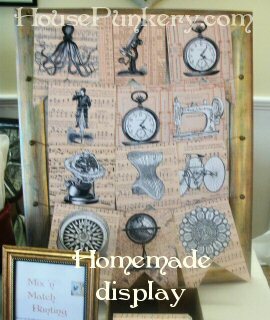 I made a display with an old frame. I painted it, glued pretty paper right on the glass, strung wire on it with pretty brads, and made an easel back with foamboard (all supplies but the frame from my little WalMart). Now I can hang bunting, paper dolls, or whatever. I also used some old books to elevate things a little. If I do a big 10×10 space I know this will be one of my challenges. I had a lot of stuff in my house that I could use to display, but it took some creative thinking to find things that would fit my items. I did do a tour of a couple thrift stores and bought a few pieces. Just be careful about your display pieces, some people will think anything on the table is for sale, even if it totally doesn’t look handmade. You don’t want to distract from your items. And you don’t want people looking at your pretty boxes and then not seeing the item for sale on top of it. This is why so many people just use crates to build up their display. Speaking of mock-ups, do a display dry-run, preferably like a week before. Even if your items aren’t done and you don’t have the right size table, do a dry-run. Originally I used masking tape to mark off the 6×2 space on my dining room table. I left spaces for the items I didn’t have done. This helped me to see what my potential display pieces looked like together, and what I could fit in the space. You may find that one of your items “pops”, and you should make more of those since they will most likely sell better. Or that one of your planned displays just won’t work, and you need to find an alternative. This will also help you have a visual in your head for when you go to the thrift store and yard sales, to help you evaluate new pieces. Also keep in mind a plan “B” for each item. If the wind blows over that frame and breaks it, how will I display those items (yes, even indoors, they had the door open to allow people easy access and one display got blown over, twice). Once you have a good mock-up take photos you can refer to the day of. Also someone can use them if something happens to you (like the flu), and someone else has to set up and man your booth for you. 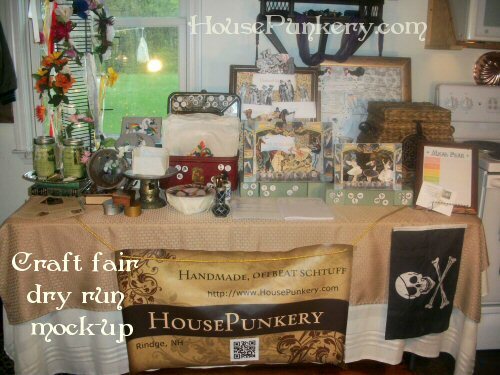 You can also use this photo when applying for other craft fairs, juried fairs will require a photo of your booth set-up. Pricing is a difficult challenge. The conventional wisdom is to add up your supplies, your time, and your business expenses divided by the number of hours you work in a year. Multiply this by two for wholesale prices and four for retail. I found that this did not work for me, even paying myself only $8 an hour my prices were more than anyone else on Etsy. So I figured out my supply costs and multiplied it by four. Then rounded up, usually to the nearest $5 or even dollar (like my $17.28 item was $18). I made sure if I divided that price in half (in case someone wanted to buy wholesale), I still was paid for my time plus a little bit. This formula came out to a much more reasonable price, in-line with what I was seeing online. Also items at craft fairs or otherwise in-person seem to be priced a little lower than Etsy. How will you accept payment? Really, the only place people bring change now is to craft fairs and festivals, and that isn’t even true for the big ones. I accepted cash or personal checks. Since it was a town fair most people were local, and I would require an id with an address that matched the checks, and a phone number (no starter checks). I was also prepared to absorb a bad check if I had to, and not allow checks for amounts I could not absorb. If I had a smartphone I would get a Square in a heartbeat. But I don’t have one of those new-fangled (read: expensive) things. Whatever you accept, make sure you have a sign out clearly stating your payment methods. Especially if you accept credit cards. This makes it so easy to buy, the money practically falls at your feet. Also, how will you keep track of your cash? I bought a cashbox and an apron (both cheap), but my hubby had the cash box at the yard sale at home. However, I think the apron is the better way to go. You move around so much it’s better to be mobile, especially if you are in a 10×10 tent. I don’t want to be tethered to a table with a box that someone might mess with if I wander over to help a customer. I might bring the cashbox to transfer “extra” money to, but then I’ll have to worry about someone getting into that. So maybe not. I created an Event on Facebook, and a listing on my site. This had all the pertinent details, as well as a link for more info. A week before I reminded people of where I would be on Facebook, Twitter, and Google Plus. A few days before I reminded again. I considered offering an incentive, like mention you saw us on Facebook and get a free blah, but I didn’t get that far. If I had a smartphone I would have taken a pic of my setup the day of and told people to get their butts down there. Alas and alack. I posted a photo the next day, when it did not help anyone show up. But I have it for posterity. Pack up your stuff and load it into the car the day before. So tag all your items Tuesday, do your final mock up Wednesday (and take photos to refer to the day of), start packing boxes Thursday, make snacks, pack the car, and withdraw cash Friday, and do your event Saturday. This means if you have a life as well you need to have all your items done by Monday, and if they require time to dry or cure they need to be done even earlier. Why didn’t I do that little time break-down in my head beforehand? Maybe I like to make my life complicated? I am shy, and an introvert. I love people, I’m just afraid of new things. This was not my worst nightmare, but I knew it was outside my comfort zone. In normal life I’m not good at making eye contact or conversation, so I knew I had would have some difficulties. I did read a couple articles on the art of selling to people, to get some tips. The prospect of sharing my love of all things sparkly is exciting, so that is a plus. I think crafting is like cooking, if you put the love in there people can tell.